Which Countries Does The United States Not Have Diplomatic Relations With Now That Cuba Is Off The List? Shortly after midnight Sunday, the United States and Cuba restored full diplomatic relations, officially ending a five-decade standoff between the former Cold War enemies. Though the historic move was announced last December by President Obama and Cuban President Raúl Castro, the July 20 kickoff officially opened the road for reestablishing embassies in each other's nations. And with that, there are less than a handful of countries the United States doesn't have diplomatic relations with. Without ceremony or much fanfare, workers soon after hung the Cuban flag in the State Department lobby, where the pennants of other U.S.-recognized countries are displayed. Foreign Minister Bruno Rodriguez will oversee the raising of Cuba's flag over a mansion in Washington that will serve as its embassy in the States. 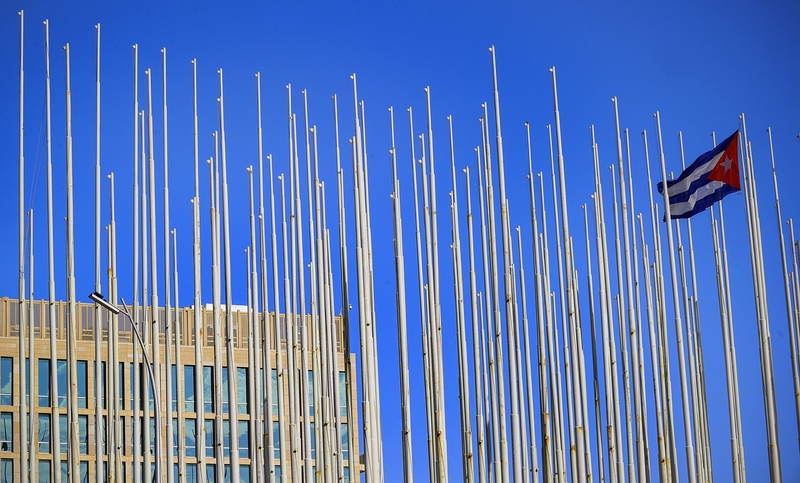 Though the U.S. embassy in Havana will also open Monday, Secretary of State John Kerry is expected to visit next month for the official flag raise. While the embassies mark a milestone for the two countries, there's still plenty of work to be done. After all, only Congress can lift the United States' embargo against Cuba, and the fight in the Republican-led House and Senate is far from over. But the outlook is promising, and now the question is who's left in the list of countries that don't have official ties to the United States. The United States and Bhutan, a small South Asian country tucked in the Himalayas between India and China, have no formal relations, though there is some contact through informal channels such as the U.S. embassy in New Delhi. Bhutan joined the United Nations in 1971 but has no diplomatic relations with any of the Security Council. Until recently, Bhutan was a satellite country for India. Diplomatic relations between the United States and Syria have been off and on since the Middle East country gained independence from France in the 1940s. As of March 2014, the two nations hold no relations, and the United States currently maintains economic sanctions against the country largely for housing terrorist organizations. The Obama administration has repeatedly called for Syrian President Bashar al Assad to step down. Yes, there might be a preliminary nuclear deal in place between Iran and six major world powers, but that doesn't change the United States' official diplomatic stance with the Middle East country. In the wake of the Iran deal, Secretary of State John Kerry assured Americans the move would not lead to restarting relations with Tehran. The United States and Taiwan have held unofficial relations since 1979, when the U.S. first formally recognized the government of the People's Republic of China, based in Beijing. The United States continues to recognize People Republic of China's government as the only legal governing entity but doesn't recognize China's claims of sovereignty over Taiwan. The United States and Taiwan are trading partners across the Pacific. North Korea is one of the United States' most significant antagonists, and official contact between the two has been relatively nonexistent since an armistice put off the war between North and South Korea in 1953. The United States currently deals with North Korea through the Swedish embassy in Pyongyang. In 2009, North Korea appeared to jump start its nuclear program in spite of international objections, including those from the United States, which further deteriorated relations. Other than humanitarian aid such as food in times of famine, an embargo prohibits any form of U.S. economic assistance for the country. But that's not to say things won't change in the future for the United States and any of these countries. For a whole generation of Cubans (or several, really), the notion of a U.S.-Cuban friendship was something of a lost dream. But diplomacy is a very real solution, and this move could signal a dramatic change in how the United States deals with those outside its borders. Who knows, maybe Iran will be next, and another country can be checked off this list.